Bowls Section invite all Club members, friends, family etc. to participate in their next Quiz Night, Sunday 26th November, at the Clubhouse. 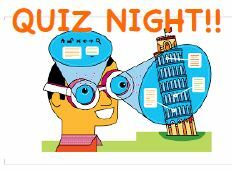 These quiz nights are proving very popular so make sure you don’t miss out in a chance to test your brain power! A tasty Pie and Pea supper will be served and the bar will be open. What more can you ask for? Quiz starts at 7 pm and tickets are available at just £6.00 each! Friday 15th December. Start time 8pm with buffet meal in the first interval. 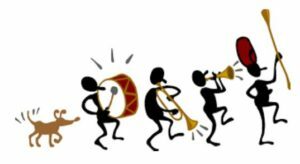 For their final gig of 2017 (30th Anniversary Year) JAZZ have asked their Patron (Nikki Iles) to re-join her one time musical partner, Tina May, and have invited them to put a band together which would be great fun for a party. If you like your music sassy, sharp and swinging then this is for you! Please see website for more information and to book tickets. (Please note this is an All ticket gig so make sure you book in advance). 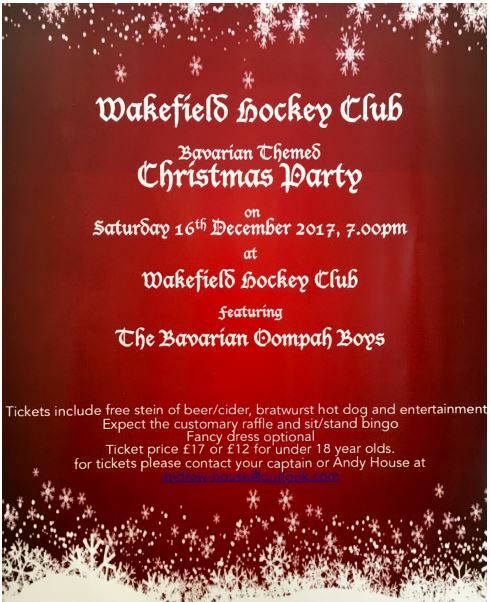 Calling all Hockey Club Members! 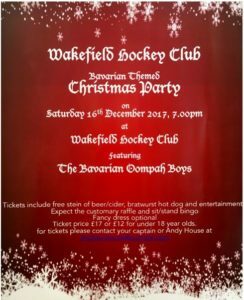 Hockey Club Bavarian Christmas Party! 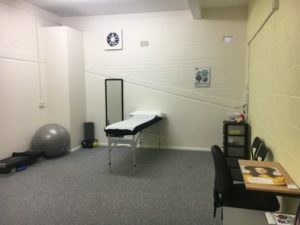 Beginners with little or no prior experience are especially welcome at R & P Club. The following is a little information on how the membership works: Each person who joins the Club will have to pass a probationary period before being granted full membership status. This is required in order to apply for a firearms certificate. During this time safety, technique and shooting skills are taught along with ample opportunity to try lots of different firearms The minimum period before anyone can become a full member is 3 months and a minimum of 12 separate visits. Wednesday – Beginners’ night. Please see website www.wrpc.co.uk for further information. It’s that time of year again when the bowling greens are off limits, being fed and nurtured ready for the next season. So, in the meantime members are enjoying playing on the Astro pitches two mornings per week (Monday and Wednesday) until next Spring. Training times: (Weds) Mens 6-8s 7-8.30pm Mens 3-5’s 8.30-10pm. Ladies 3-5’s 8.30-10pm. (Tues) Mens 1’s&2s, 8.30-10pm. Ladies 1’s&2’s 7-8.30pm. (Thurs) Mens 1’s&2’s 7-8.30pm, Ladies 1’s&2’s 8.30-10pm. Junior training Sundays 9-12noon, Tues & Thurs 6-7.30pm. Flyerz Tues 7-8pm. New members are always welcome. Please see hockey’s website for further details. England Squash – Silver Event! 24th – 26th November 2017 to be held at Pontefract Squash and Leisure Club and Wakefield Squash Club Wakefield Squash Club are hosting this prestigious event in connection with Pontefract Squash Club. They are expecting 200 of the country’s best juniors playing between Pontefract and Wakefield over the weekend. Entry fee is £25 (which includes a souvenir T-shirt. Categories: Boys and Girls Under 13, 15, 17 & 19. Peter Shaw performed very well at the British Chess Championships in Llandudno in July. He scored 5.5 out of 9 and defeated seven times British women’s chess champion Jovanka Houska, during the tournament. He followed up in September by coming first at the Bradford congress, winning £225.00. Richard Wilson came second equal in the minor section of the Wakefield congress in September. The new season has just started again both on Saturdays and Wednesday evenings. They continue to be a very active club with a thriving junior section. 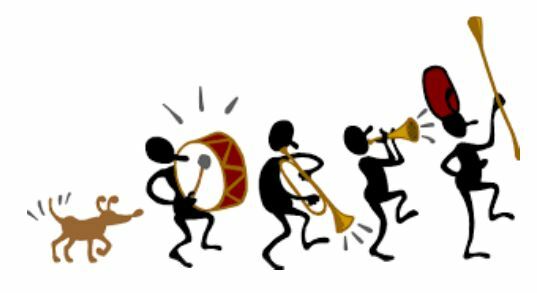 This entry was posted in Bowls, Chess, Family Gathering, Hockey, Jazz, Party, Rifle & Pistol, Squash, Wakefield Jazz by WSC Webmaster. Bookmark the permalink.